How often do you pick a coffee on your way to work? Do you do it every day? If so, do you buy it or do you brew it? If you’re regularly buying your drink from a coffee shop, you’re spending a tiny fortune every month. Instead of doing that, why don’t you invest in a commercial espresso machine? With a commercial super-automatic, you can get a cup of fresh and yummy coffee just by pressing a few buttons – no more waiting in line and overspending. 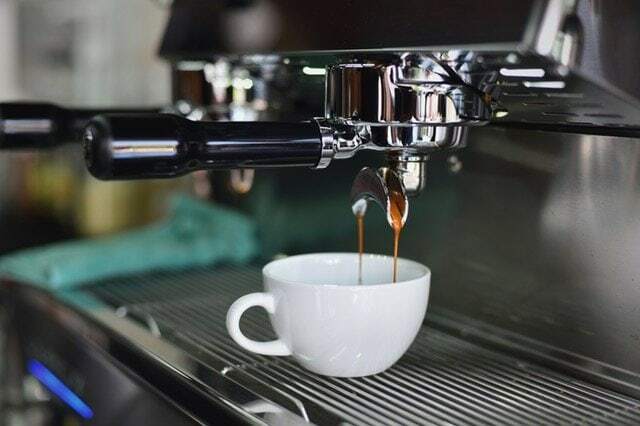 So, whether you’re in it to learn more about the process or just enjoy the end result of it, a coffee lover like you deserves the best commercial espresso machine for your needs. And, we will help you find it. Right knowledge and understanding lead to right purchases. So, we’ve split the article into two sections. The first section contains commercial espresso machine reviews. Through the reviews, you will get to know the best products on the market. The second section discusses details of factors to consider when buying a commercial espresso machine. This section will help you understand what makes a product great in this segment. By using the information in the two sections, you will get clear on which product to buy. 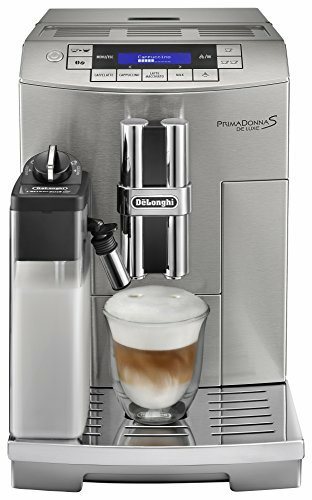 So, let’s begin with our top pick, the DeLonghi Prima Donna. Are you spending a tiny fortune buying your drinks from coffee shops? Well, the DeLonghi Prima Donna lets you brew professional quality drinks yourself. This super automatic coffee machine takes all the guesswork involved in brewing the perfect cup. In other words, it’s the perfect machine for people who are interested only in the “end,” and not the “means” of coffee brewing. 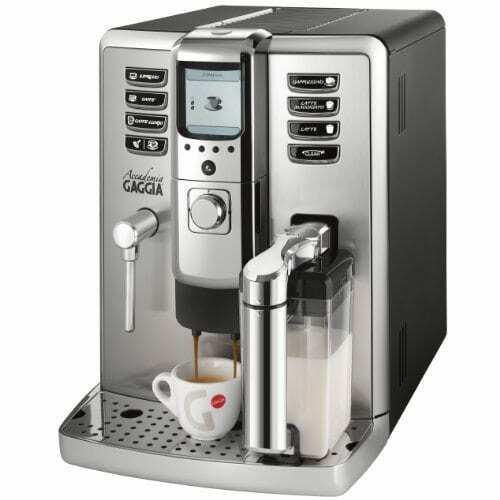 The pre-programmed settings facilitate one-touch brewing for espresso, caffè latte, cappuccino, and latte macchiato. The factory settings consistently produce delicious coffee. But, there’s little you can do to change these settings. The built-in burr grinder grinds coffee just before brewing, keeping the flavor at its best. The machine is also easy to clean and maintain. The Prima Donna not only brews excellent coffee but also looks good doing it. The Prima Donna’s high price, ease of use, aesthetic appeal, and versatility makes it the ideal coffee machine for an office environment. Its addition will help boost morale and maintain productivity. But, if you want to go deeper into the art of brewing coffee, this isn’t the best option because it offers limited control over variables such as dosing, temperature control, and brewing time. Although the DeLonghi Prima Donna and the Breville Oracle are excellent commercial grade coffee machines in their own right, the two couldn’t be more different. While the Prima Donna is a super automatic machine, the Oracle is an automatic manual machine. That sounds a little confusing, but you’ll see what we mean in a moment. The process of brewing coffee on the Oracle uses portafilters. So, it’s different from one-touch brewers like the Prima Donna. And, unlike semi-automatic machines, the Oracle doses, grinds, and tamps coffee into a portafilter without your involvement. At the end of the process, you get a ready to go portafilter into which you can pour the shot. The nature of the brewing system allows for great control and transparency over the process. You can control variables such as brewing time, dose, grind, temperature, and tamp force. The milk-texturing process is amazing as well. You can preselect the temperature and foam level and let the machine do the work. Or, you could froth the milk manually. We consider this a commercial grade machine because of the degree of control it gives to the brewer. So, if you’re looking for a coffee machine to sharpen your pouring skills or latte art, the Oracle is the machine for you. The Pasquini Livia 90 is a semi-automatic commercial grade coffee machine. It’s significantly more economical than the Prima Donna and the Oracle. But, as you very well know, price reductions go hand in hand with tradeoffs. So, let’s examine the benefits and pitfalls of buying this coffee machine. The Livia 90 is a compact coffee machine with which you brew coffee in the traditional portafilter-style. It has a double boiler. So, you can pour coffee and steam milk at the same time. The graduated pressure gauge and lamp indicators signal the right moment to begin pouring. And, the downtime between consecutive pours is also lower compared to other semi-automatic machines. Another notable advantage is the build quality. But, the problem with the machine is that it does not have a grinder. So, you’ll need a separate grinder. Plus, you have to manually prepare the portafilter for pouring. All the steps that were automatic in the Oracle have to be done manually on the Livia 90. But, this is not a problem unique to this machine. It is an inherent fault of all semi-automatic machines. However, the inconvenience grants better control over the process. So, it’s a great investment for anyone who wants to get down and dirty with the coffee machine. 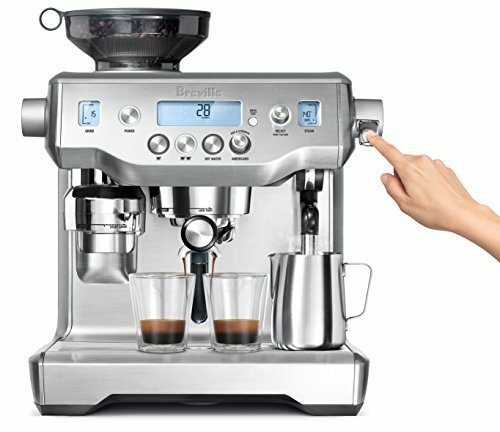 The Breville Barista Express is a mini version of the Oracle. In terms of capabilities and control, it stands between the Livia 90 and the Oracle. But, price-wise, the Barista Express is a bargain. So, if you’re planning on buying a budget-friendly commercial grade coffee machine, this is your best option. Like the Oracle, the Barista Express lets you select grind quality, grind amount, filter size, and temperature. Although the PID temperature control isn’t as sensitive as the Oracle’s, it still does a great job keeping the brew in the right zone. However, the machine does not automatically tamp the portafilter. You should do it yourself. But, this isn’t a big deal because the machine comes with a tamper attachment. The Barista Express also has separate spouts for hot water and milk frothing. The machine is not a double boiler. So, it takes about 30 seconds to get the steam running. Also, you should judge the temperature and consistency of the froth yourself. For this price, you can buy a high-end super automatic for home use. But, a super automatic will take control of the total process, leaving you with very little/ less room to play with the variables. The Barista Express, on the other hand, gives you plenty of control over the process. So, it’s a good cost effective machine for those who love experimenting. The Gaggia Accademia is another great one-touch commercial grade espresso machine. It’s more economical than the DeLonghi Prima Donna and it offers better control over variables such as dose, grind quality, and temperature. Though the control isn’t as precise as the ones on the Oracle, you should bear in mind that one-touch machines aren’t built that way. What we love about the Accademia are the preset functions. You can brew espresso, cappuccino, latte macchiato, and latte at the touch of a button. To a certain degree, you can even control the dosing, pre-brewing time, temperature, coffee length, and milk length. So, it offers more options to customize your drink. The Accademia also comes with an auto-start timer. And, you can even program the timer to go off at different times on different days of the week. Another great feature is that the milk spout purges itself after use. So, you don’t have to worry about residue clogging the spout. The Gaggia Accademia delivers excellent performance because of its versatility, high-quality, user-friendliness, and build quality. You can use it in a home or work environment and enjoy the benefits of having your own personal barista. Why should I buy a commercial model? At the lowest level, you will find coffee machines that use pre-ground coffee. These machines are easy to use and inexpensive. But, the taste leaves a lot to be desired. To elevate the taste, you can buy a coffee grinder or a coffee machine with a grinder. Using a grinder yields an instant flavor boost. 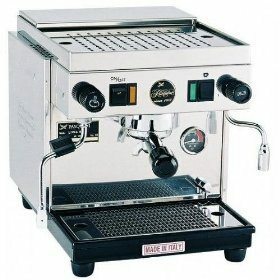 If you are still not satisfied with the flavor, you need to go for a commercial espresso machine. If you want to be the barista, buy a semi-automatic. Since you clearly see what’s happening at every step, you have control over everything. This allows you to play with the variables. For example, you can measure the effect of temperature on taste when all other factors are the same. A semi-automatic coffee machine opens doors to endless experimentation. But, it’s also difficult to master. If you don’t have the time or inclination to learn the art of brewing, buy a super-automatic coffee machine. A super-automatic comes with a list of pre-programmed drinks. A few button-presses later, the machine does all the barista work and delivers a cup of delicious coffee. It’s almost like ordering a drink from a coffee shop. But, if you don’t like the drink the way the machine makes it, you can’t do much about it. Take a moment to pick your recommendation for the above requirement. Now, here’s what we think. To hone latte art skills, a semi-automatic is the best option. For an office space, a super-automatic is the best choice. For the book club, both machines would work depending on the person running the coffee shop. In the same manner, consider your purpose of buying a commercial espresso machine. This will point you in the right direction. What are the important factors I should look for when buying a commercial model? Whether it’s a super-automatic or semi-automatic, commercial espresso machines are expensive. To help you get the best value for your money, we’ve created a list of important factors that add value to a coffee machine. You can use the following list as a reference to judge the worth of a machine. Built-in Grinder: A built-in grinder crushes coffee pods just before brewing. This keeps the flavor at its best. Every barista-like coffee starts with freshly ground coffee. Type of Grinder: Most commercial machines come with a burr grinder. But, there are different types of burr grinders. For your reference, flat burr grinders work better than conical burr grinders. Also, ceramic burr grinders work better than steel burr grinders. Avoid machines with blade grinders. Grind Quality Setting: The texture of the ground coffee affects contact time, extraction rate, and flow rate. So, it’s essential that the machine allows you to change the texture of the coffee from fine to coarse. Dose Setting: Dose is the amount of coffee that goes into the filter after grinding. Dosing affects the strength of the brew. The higher the dose, the stronger the coffee. Temperature Setting: To extract the best flavor from coffee the extraction must happen within 195° F and 205° F. But, the specific temperature depends on the variety of coffee pods you use. For fine control over flavor extraction, the machine must allow temperature regulation. Type of Temperature Control: Coffee machines with a PID temperature controller can maintain the brew temperature within tight tolerances. Machines without this feature have a larger margin for error. Type of Boiler: The boiler heats the water before it’s circulated to the group head or steam spout. Machines with a double boiler or a heat exchanger boiler let you pour coffee and use the steam spout at the same time. Single boilers take time to switch between pouring and steaming. A PID controlled double boiler is the best choice. Cleaning and Maintenance: Many breakdowns in commercial coffee machines result from improper use and lack of care. So, read the cleaning and maintenance instructions for the machines. Make sure you can execute the process as described in the manual. If the instructions are not clear, look for instructional videos that demonstrate the steps. Warranty and Service: Despite regular cleaning and care, machines can fail because of workmanship or material defects. In such cases, a reliable warranty and service network reduces financial losses. In addition to these factors, you can consider the aesthetic appeal, build quality, size, and cost of the machine. Also, we recommend you visit a dealership for a first-hand experience of the machine before buying it. No review can capture every detail of the machine. So, direct experience really helps. You can revisit the list of our top 5 commercial espresso machines and pick a product from there. This would be the easiest and fastest option. However, if you want to explore options beyond what’s listed here, check out products from DeLonghi, Breville, Gaggia, and Jura. In the light of our reviews of commercial espresso machines, the top super-automatic machines on the market are the DeLonghi Prima Donna and the Gaggia Accademia. 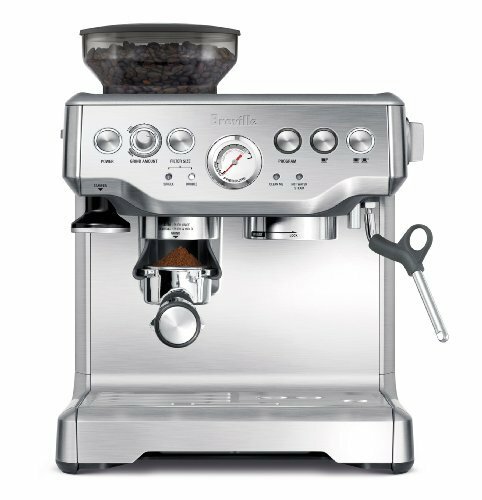 The Breville Oracle is the top semi-automatic. But, these are high-budget products. If you’re looking for something on the conservative side, you can go for the Breville Barista Express or the Pasquini Livia 90. You could also explore other choices based on the factors to consider when buying a commercial espresso machine. While surveying the market, you will notice there are many products in every price bracket. But, only a few of them are of high-quality. Without proper direction, the clutter distracts people from the useful. Fortunately, that’s not you. The right product for your budget and requirement is waiting for you. And, you have everything you need to find it. We’ve also written a buying guide on espresso machines for home use that you should check out if you’re not looking for a commercial machine.